Last night (Dec. 6), I watched a PBS special on the Highwaymen and heard Kris Kristofferson singing Me and Bobby McGee. One familiar line jumped out at me, and I added it to the page of short quotations that opens Like Clockwork. That line encapsulates one of the strongest human sentiments, the fear of loss and the nearly insane clinging to that which cannot last. What would you do if you were given the chance to relive the prime year of your life? Would you take the chance, or would you proceed into the unknown future? Like Clockwork asks — and answers — that question. It begins and end at midnight on the last/first day of the Only Year. Here is the Prolog to Like Clockwork. Or is it an epilog? Or something else altogether? You decide. “Tonight Snap has gone down to the Clock for Midwinter Midnight. In just a few minutes, the reversion will occur and I will forget writing this note. It will be midnight of January first, 1850. Not next year, nor last year, but the only year there is. It was probably her imagination. Surely voices could not be heard over such a distance. She rose to move closer to a window and as she did, the note she had written ceased to be. All her memories of the past twelve months ceased to be. Her body sloughed off a year of age and it was January first of the last-this-next-only year. This entry was posted in A Writing Life and tagged fantasy fiction, literature, science fiction, seasons, steampunk, time travel, writing on December 31, 2018 by sydlogsdon. Yesterday was Christmas. 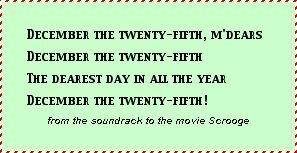 Today is the 26th of December. Happy Boxing Day. If Boxing Day is just something British you’ve vaguely heard of, let me explain. It is the holiday on which various workers expect to receive their Christmas-box from those they serve. I have never written about the commercialism of Christmas. That notion has been done to death, and besides, even Santa’s elves get paid in cookies. Christmas gifts don’t make themselves, you know. So you can imagine my surprise when, seven chapters into Like Clockwork, the Dickens-inspired steampunk novel that turned out to not be about Christmas, Hemmings appeared without warning and dragged me into exploring the commerce of my pocket London. Take a look. Throughout the main building of the Babbage Bureau of Accountancy, ten thousand human computers were required to keep up the constant cross checking of the Great Babbage, as it kept track of every transaction in all the factories and warehouses of London. It was late November. Christmas was coming, the warehouses were nearly full, and the remaining raw materials had to move through the system to produce the goods, neither running short of materials too soon, nor finishing the last needed item before the final day. Full employment, full consumption. Everybody has a job. Everybody consumes the goods that everybody else makes. Every tally book balances. The capitalistic ideal. A single employer. Every job suited to the person who does it. All those tally books replaced by the Great Babbage. The communistic ideal. Either way, it was no place to be unemployed. The ten thousand computers counted themselves lucky. They were Time’s Favored Ones. They worked seated, in gentleman’s clothing. They returned home at night unstained. Not for them was the curse of Adam, to work by the sweat of their faces. The middle fingers of their right hands all bore the honorable callus that came from holding a pen. The skin on the rest of their bodies was smooth. Time moved crisply for them, to the smooth rhythm of numerals filling up little blue squares. In the factories, time moved differently, slowing down and growing more resistant to human movement as the day wore on. That does not seem possible, but young Albert had done work in time dilation according to theories of his own. Time moved smoothly for the computers; time dragged on more slowly as the day progressed for those who bent their backs. It had always felt that way, throughout the history of mankind, and now it actually was that way. Morning, morning tea, and luncheon all rolled by with stately grace. It was at 2:18 in the afternoon, November 27, 1850, that Hemmings the computer hit a reef. His whole job was to check by hand the calculations made by the Great Babbage, looking for errors. On November 27, he found one. Did they thank him? Of course not. The Babbage was incapable of error — even though Hemmings had found one — so they fired him. Hemmings stood on the street in front of the Babbage Bureau of Accountancy and stared upward, considering the machine which had just become his nemesis. He had never seen the Great Babbage itself, but he imagined it as a massive collection of repeating components, interlaced with walkways where the technicians came and went to clean and oil and inspect. 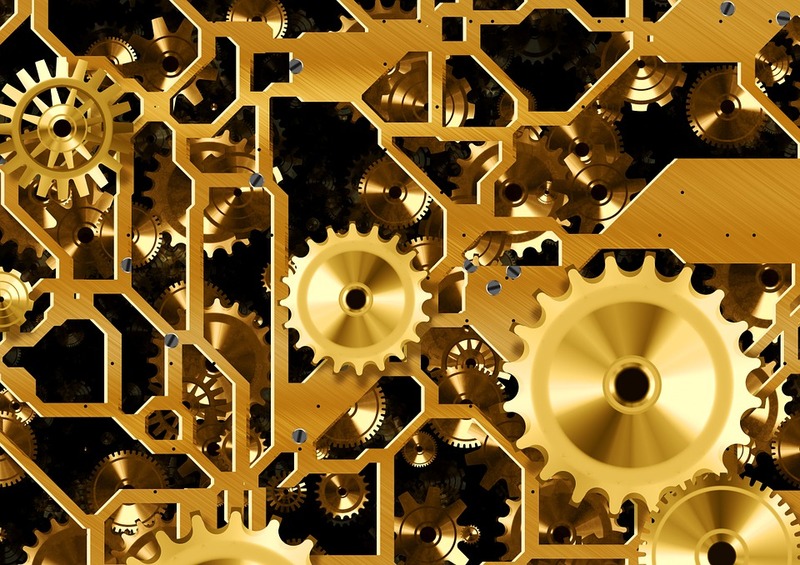 There were a trillion gears, cams, and escapements in his mental image. There were Jacquardian punch cards by the waggon load, as many cards as there were oysters in the ocean. As many as there had been oysters, when there was an ocean. Now the picture in his mind had changed. Not much, really, but enough. There was rust on some of the gears now, and some unidentifiable ooze coming out of some of the housings. Hemmings shook his head, trying to clear his mind. He knew the rust was hatred and the ooze was envy, and that they were in him, not the machine. Still, here he was, with no place in the world, ripped out of the one thing he had been trained to do. With no money to buy his food or pay his rent, no companions, no usefulness to stabilize his identity. Every stone and brick in London was unchanged, but Hemmings was changed, and suddenly he was as adrift as a chip of wood floating somewhere on the ocean. When there had been an ocean. There was no fight in him. He ate his supper where he always did, but this time he sat alone. There were very few coins left in his pocket. Then he walked. All the streets were well lighted by gaslight. There was no refuse in the gutters. There were few pedestrians, and they all were moving purposefully toward someplace they belonged. He looked at their faces. He had never cared before to look into the faces of the strangers he passed by each day, but now he chose to examine them. Their faces were calm and peaceful, but there was no joy in them. He wandered into darkness. By that time, he owned the empty streets. He needed sleep, but it was hard to choose a place to lie down. Every place was identical to every other place. It clearly did not matter where he slept, but that was why he couldn’t choose. 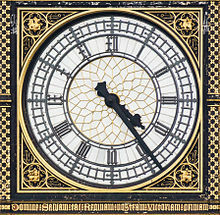 Every clock-face on every building-face in all of London said 3:35 when he could no longer stand. He crawled behind an ash can and let go of everything. He dreamed of whirling gears, and rust, and ooze. On the third day, his coins ran out. He did not eat on the fourth day. He had never been hungry before, and the misery of that condition frightened him. He considered stealing. He could go into the place where he had always eaten, scoop up a loaf of bread, and walk away. They probably wouldn’t chase him, at least not far. Then what? Would the — bobbies, peelers, cops, pigs, police — come to get him? He realized that all the names he had dredged up from deep memory were without weight or taste. He had never seen a policeman, not in a thousand iterations of the year. What kind of place is so smug, so self-righteous, so self-certain that no one breaks the law? How could there be no rebellion? He could probably become invisible to the machinery of the state and make his living by simple theft. Could the Great Babbage find him? How? Track him by arithmetic errors, by all the places which reported one less loaf of bread than the Great Babbage had predicted? Try to find me, you bucket of rusty gears and ooze. He considered the possibility of living by theft, outside the norms of the rest of mankind, and it tore at his heart. The thought hurt him more than hunger. Now, back to our world. There I was, sitting at my computer, comfortably contemplating my novel of a variant Dickensian London, when suddenly Hemmings appeared. Now my pocket London was split in two. Half would have looked familiar to Scrooge, and the other half was as four-square and linear as an equation. One half was under thrall to the Great Babbage and the other half to the Great Clock that kept turning time back on itself. Weird. I’ll let you know when you can read it for yourself and see just how weird. This entry was posted in A Writing Life and tagged Christmas, literature, science fiction, steampunk, time travel, writing on December 26, 2018 by sydlogsdon. Tomorrow is the big day, when nobody should be on the internet, so I’ll have my say today. This is the fourth Christmas season since I began this website, and every year I say the same thing. I love Christmas. Over the years, I have posted many Christmas or Midwinter posts. If you are new to this site, here’s your chance to check some of them out. My first year I posted a list of Christmas books, covering pretty much every aspect of the holiday. That same year, I talked about Dickens’s five Christmas novellas. Everybody knows A Christmas Carol; here is your chance to check out the rest. When the ghost of Christmas Past appeared, Scrooge asked, “Long past?” and was told that she meant his past. My own early Christmases on the farm wouldn’t make a Christmas card, but I told about them in Twas the Season, posts 1 and also 2. I also talked about the Nostalgia for those days that never were . Everyone talks about Mary and Jesus, but what about Jesus and Joseph? Christmas itself has a history beyond the biblical story. It has always fascinated me, and I summarized what I have learned in three posts from 2016, Old European Christmas, Colonial Christmas, and Here Comes Santa Claus. In 2016 and 2017, Christmas was overshadowed for my Latin friends by a grinch with an orange face and wild yellow hair. I wrote about Christmas for Lupe two years ago and about Jose, Maria, y Jesus in Trumpland last year. I didn’t have the heart to tackle the current occupant one more time this year. Maybe by next year I won’t need to. Anyway, whether you check out any of these links or not, Merry Christmas. This entry was posted in A Writing Life and tagged americana, blogging, Christmas, Donald Trump, history, memoir on December 24, 2018 by sydlogsdon. So, once again Serial crawls back into its bed for a long winter nap. I plan to keep the blog alive on life support until I need it again. No, make that in suspended animation; after all this is primarily a science fiction site. Meanwhile, over in A Writing Life there is a post called Links to Christmas which you can use to see past posts about the season. This entry was posted in Serial and tagged blogging, Christmas, fantasy fiction, literature, memoir, seasons, writing on December 24, 2018 by sydlogsdon. In eight parts. Click here to begin at the beginning. So, Gabriel Grub got on his feet as well as he could, for the pain in his back; and, brushing the frost off his coat, put it on, and turned his face towards the town. But he was an altered man, and he could not bear the thought of returning to a place where his repentance would be scoffed at, and his reformation disbelieved. He hesitated for a few moments; and then turned away to wander where he might, and seek his bread elsewhere. The lantern, the spade, and the wicker bottle were found, that day, in the churchyard. There were a great many speculations about the sexton’s fate, at first, but it was speedily determined that he had been carried away by the goblins; and there were not wanting some very credible witnesses who had distinctly seen him whisked through the air on the back of a chestnut horse blind of one eye, with the hind-quarters of a lion, and the tail of a bear. At length all this was devoutly believed; and the new sexton used to exhibit to the curious, for a trifling emolument, a good-sized piece of the church weathercock which had been accidentally kicked off by the aforesaid horse in his aerial flight, and picked up by himself in the churchyard, a year or two afterwards. Unfortunately, these stories were somewhat disturbed by the unlooked-for reappearance of Gabriel Grub himself, some ten years afterwards, a ragged, contented, rheumatic old man. He told his story to the clergyman, and also to the mayor; and in course of time it began to be received as a matter of history, in which form it has continued down to this very day. 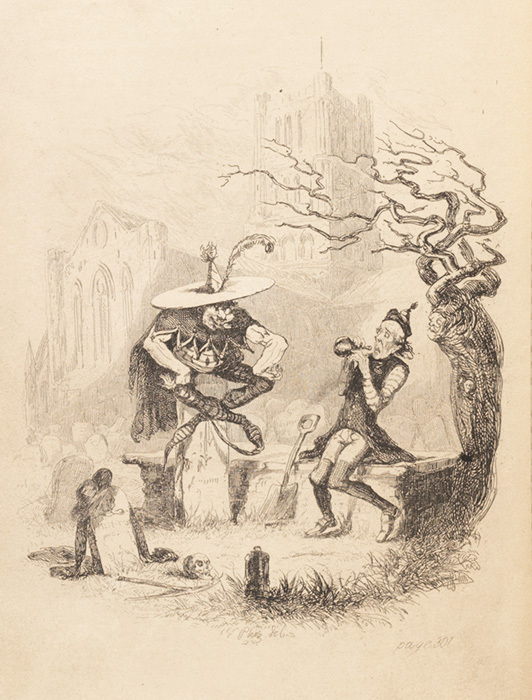 The believers in the weathercock tale, having misplaced their confidence once, were not easily prevailed upon to part with it again, so they looked as wise as they could, shrugged their shoulders, touched their foreheads, and murmured something about Gabriel Grub having drunk all the Hollands, and then fallen asleep on the flat tombstone; and they affected to explain what he supposed he had witnessed in the goblin’s cavern, by saying that he had seen the world, and grown wiser. But this opinion, which was by no means a popular one at any time, gradually died off; and be the matter how it may, as Gabriel Grub was afflicted with rheumatism to the end of his days, this story has at least one moral, if it teach no better one – and that is, that if a man turn sulky and drink by himself at Christmas time, he may make up his mind to be not a bit the better for it: let the spirits be never so good, or let them be even as many degrees beyond proof, as those which Gabriel Grub saw in the goblin’s cavern. This entry was posted in Serial and tagged Christmas, fantasy fiction, literature, seasons, writing on December 20, 2018 by sydlogsdon. Things always look different in the rear view mirror. If I were telling the story of Apollo 8 as it was understood when it was happening, it would be a different story than what it looks like today. We in the US knew what we were doing. We suspected what the Russians were doing, and our actions were based on those suspicions. We were wrong. Here’s what was going on that we did not know then. The Russians were developing a rocket, the N1, similar in size to the Saturn V. It was designed to carry two men into lunar orbit and allow one of them to land. America was aware of the existence of the N1, but not in any detail. 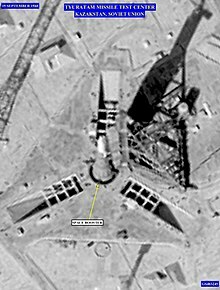 It had been seen by reconnaissance satellite (shown here), but little else was known. Russia looked much closer to reaching the moon than the facts warranted. In fact, the first N1 launch attempt came two months after Apollo 8, and was a disaster. There were four launch attempts in all, the last in November 1972, almost three years after Apollo 11. All ended in massive explosions and the N1 program was cancelled. We didn’t know any of this until decades later. Based on our assessment, the Russians seemed to be on the verge of reaching the moon first, particularly after the delays that followed the Apollo One fire. The LEM was not ready for use. The next mission was supposed to be in high Earth orbit, but NASA decided to go for broke instead. They changed the Apollo 8 mission, with only a few months to go, from an Earth orbit mission to a circumlunar mission. On December 21, 1968 — fifty years ago this Friday — Frank Borman, James Lovell, and William Anders launched from Kennedy Space Center. For anyone younger than sixty, it is impossible to recapture the feeling of the moment. We all know how the story came out, and that will be true over the next few years as a whole batch of fifth anniversaries come and go. At the time these spaceflights took place, no one knew if any of the astronauts would return to Earth alive. The launch occurred at about eight AM, EST. The first and second stages burned their fuel and fell away. The third stage placed the craft in Earth orbit and remained attached. The craft spent nearly three hours in near Earth orbit. This was standard; it allowed a full post-launch check before the craft’s irreversible journey to the moon began. Return to Earth from an aborted mission remained a possibility until the third stage fired again. Once the third stage had fired, the CSM separated and rotated to have a view of the third stage and the retreating Earth. Having the spacecraft and the unmanned third stage on the same orbit was no part of the plan, so after five hours, the third stage vented its remaining fuel changing it to a different orbit that would not get in the way of the CSM. The rocket in the Service Module was not used on the way to the moon. It could not be, for reasons that will be explained when we look at Apollo 9 in late February. After nearly three days, Apollo 8 reached the vicinity of the moon. The Service Module engine fired for the first time, slowing the craft to place it in lunar orbit. 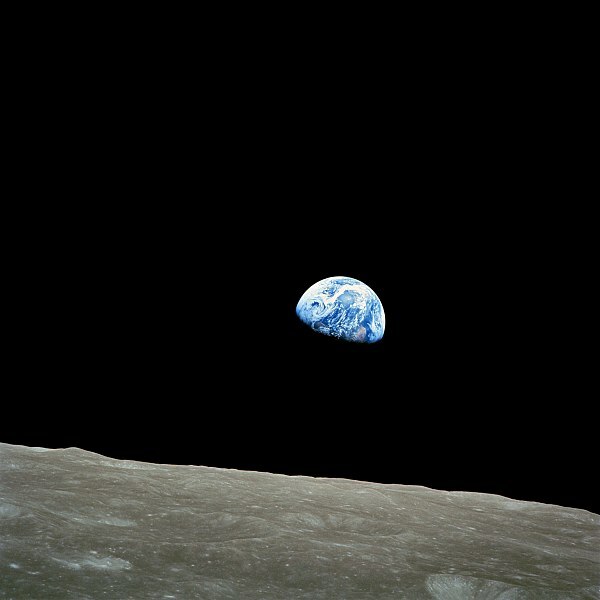 The famous Earthrise photo at the top of this post was taken shortly thereafter. During the next twenty hours, Apollo 8 orbited the moon ten times. Then the Service Module engine fired again, sending them back to Earth to land in the Pacific on December 27th. The lunar orbits took place on Christmas Eve and Christmas day. While in orbit, the astronauts read the first ten verses of the book of Genesis in a TV broadcast to Earth. I have never been comfortable with that action. I recognize the need to comfort and unify the country at the end of a troubled year, and the need to set America apart from Russia. After all, Khrushchev had stated the Russian position when he said, “Gagarin flew into space, but didn’t see any god there.” And, despite those of us who disagree, America is demographically and historically a Christian country. Nevertheless, why Genesis, the part of the scriptures most quoted by those who would hold back science? They would have been better to follow the lead of Linus van Pelt and quote Luke 2: 8-14. It was Christmas, after all. The went, they orbited, and they returned. It doesn’t sound like much if you put it that way, but there was an additional factor. What if they didn’t make it back? By the time of Apollo 8, eight astronauts had died in training or in on the launch pad. All those deaths were virtually instantaneous, but death in space could come another way. Astronauts could become stranded, unable to return. America had held its breath before, but going to the moon upped the ante. The possibility of three men being trapped in lunar orbit and unable to return was on everybody’s mind during Apollo 8. With subsequent moon landings, everybody worried about men being trapped on the moon, and unable to return. It all turned out well; we know that now. But to have a sense of how it felt to those of us who watched it in real time, you have to factor in the fear of complete disaster. This entry was posted in A Writing Life and tagged Christmas, cosmonauts, forgotten heroes, history, spaceflight, USSR, writing on December 19, 2018 by sydlogsdon. Many a time the cloud went and came, and many a lesson it taught to Gabriel Grub, who, although his shoulders smarted with pain from the frequent applications of the goblins’ feet thereunto, looked on with an interest that nothing could diminish. He saw that men who worked hard, and earned their scanty bread with lives of labour, were cheerful and happy; and that to the most ignorant, the sweet face of Nature was a never-failing source of cheerfulness and joy. He saw those who had been delicately nurtured, and tenderly brought up, cheerful under privations, and superior to suffering, that would have crushed many of a rougher grain, because they bore within their own bosoms the materials of happiness, contentment, and peace. He saw that women, the tenderest and most fragile of all God’s creatures, were the oftenest superior to sorrow, adversity, and distress; and he saw that it was because they bore, in their own hearts, an inexhaustible well-spring of affection and devotion. Above all, he saw that men like himself, who snarled at the mirth and cheerfulness of others, were the foulest weeds on the fair surface of the earth; and setting all the good of the world against the evil, he came to the conclusion that it was a very decent and respectable sort of world after all. No sooner had he formed it, than the cloud which had closed over the last picture, seemed to settle on his senses, and lull him to repose. One by one, the goblins faded from his sight; and, as the last one disappeared, he sank to sleep. This entry was posted in Serial and tagged Christmas, fantasy fiction, literature, seasons, writing on December 19, 2018 by sydlogsdon.